The animals arrived at W.O.L.F. jammed in a horse trailer so tightly they could not even receive water. Shocked at their conditions, WOLF volunteers immediately unloaded the animals and placed them in newly-built enclosures at their temporary home at Wide Awake. In May of 2006 the owner of a backyard breeding operation in rural Wisconsin died, leaving twenty-two wolf-dogs living on chains in horrendous conditions. The owner had been ill for several weeks until she was found, near death, by a friend. During the owner's illness, water for the animals had run out, there was no food, and the animals' condition had deteriorated drastically. The small Wisconsin town closest to the operation was ill-equipped to handle the rescue of so many animals, so the Animal Humane Society in a neighboring town in Minnesota stepped in to help the wolf-dogs. WOLF received a call from the AHS asking if we could take the wolf-dogs, and after dehydration and starvation only eighteen animals were alive to begin the rescue, we call Wide Awake. The animals arrived jammed in a horse trailer so tightly they could not even receive water. Shocked at their conditions, WOLF volunteers immediately unloaded the animals and placed them in newly-built enclosures at their temporary home at Wide Awake. 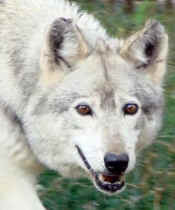 The animals began the slow process of healing physically and emotionally from the trauma of their earlier lives and as space opened at WOLF they were moved to their forever home and released into ½ acre enclosures. They learned the daily routines at the main facility, they became very comfortable and began protecting their new territories. We are amazed and humbled by the recovery that these animals have made over the years, and we are grateful to have been given the opportunity to provide them with a better life, she has developed so much which you can tell from the following story by one of our dedicated volunteers.